I made many trips to the Oregon coast during the last year and a half when I was living in Oregon. Although I truly appreciate the mountains and the deep inland forests of the Pacific Northwest, I will always be a lover of the coast. It’s the place I feel most at home and inspired no matter where I am in the world. Give me a glimpse of the ocean, a whiff of salty air, and I’m exactly where I need to be. The Oregon coast is a lot different from the California coast where I grew up, but it’s just as stunning in very different ways. Everyone should take the time to do a proper west coast road trip at some point in their life. For when you make the drive yourself, I put together a short Oregon coast road trip itinerary with a list of stops that should make the cut. Of course, there are plenty of things to see along an Oregon coast drive, so feel free to add on during your own road trip. 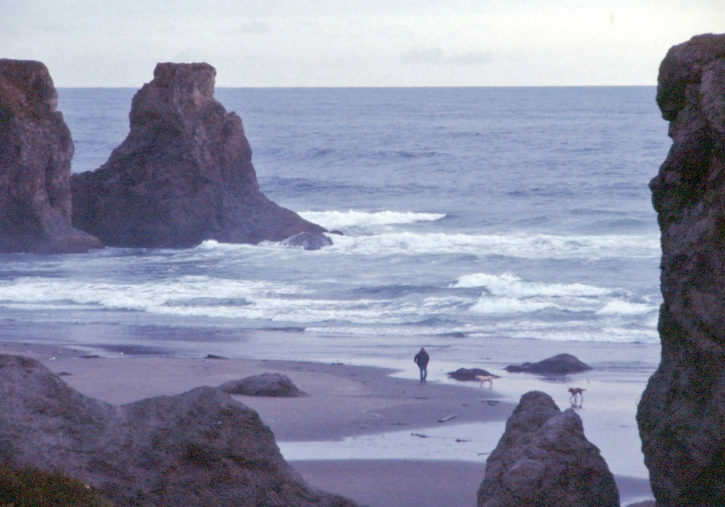 An Oregon coast trip is not a journey to be rushed. 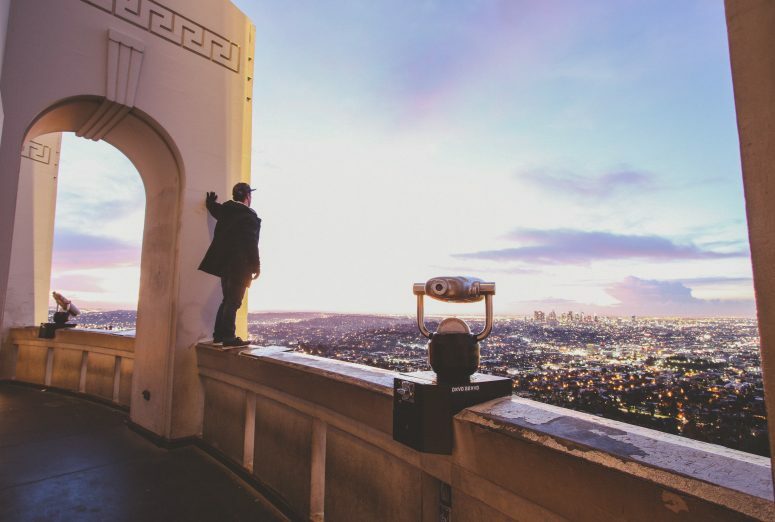 You’ll want to allow extra time for making random stops and witnessing the crazy views you’ll come across. 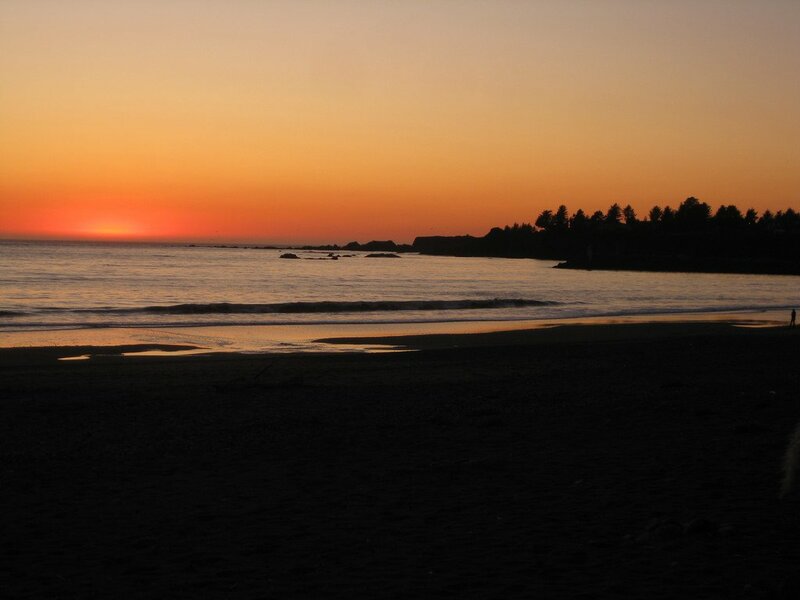 There’s a lot of hiking that is just off Highway 101, so take your time and enjoy the natural beauty. If you want to know where to stay on the Oregon Coast, get your free Oregon Coast Road Trip Planner + Checklist below! Get access to an ultimate checklist to the perfect Oregon Coast road trip here! Plus where to eat, stay, and a surprise bonus. This tiny city is about as far south as you can go without finding yourself in California. The shores of Brookings have the feeling that a storm could just be on the horizon. It’s the perfect first stop for your Oregon coast drive! The locals make up a population of just over 6,000, and they’re a friendly and tight-knit bunch that bask in the small town nature of their city. Stop in for a pint and a meal at the Fat Irish Pub, and then walk down to the water to spot the different sailboats. If there’s one place you can’t miss on the south Oregon coast, it’s the Samuel H. Boardman State Scenic Corridor. This place is all of your coastal Pacific Northwest dreams come true. 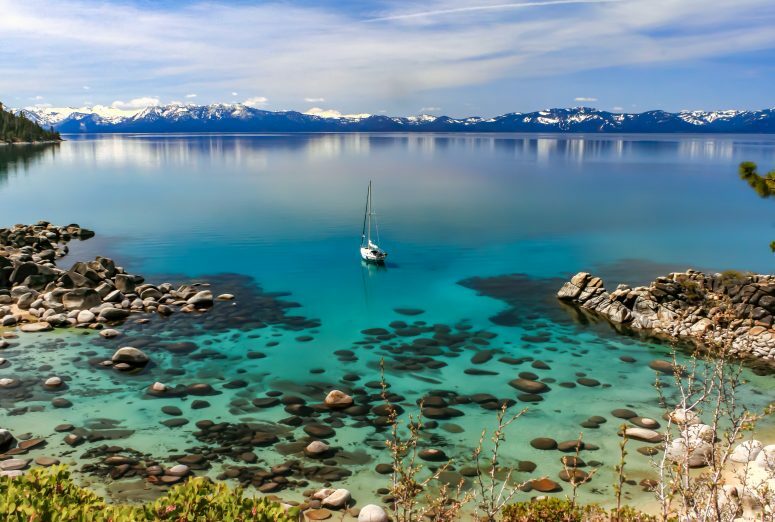 There are plenty of lush forests that come up to the beach, hard-to-reach deserted beaches, huge jagged rocks, and that perfect water color to look at all day. This corridor is 12 miles long and there are a variety of places you can stop in at along the way. Honestly, you could randomly choose your stops and you wouldn’t be disappointed, this place is that beautiful. Make sure to find Arch Rock and Natural Bridges, and spend some time around the 300-year old sitka spruce trees. 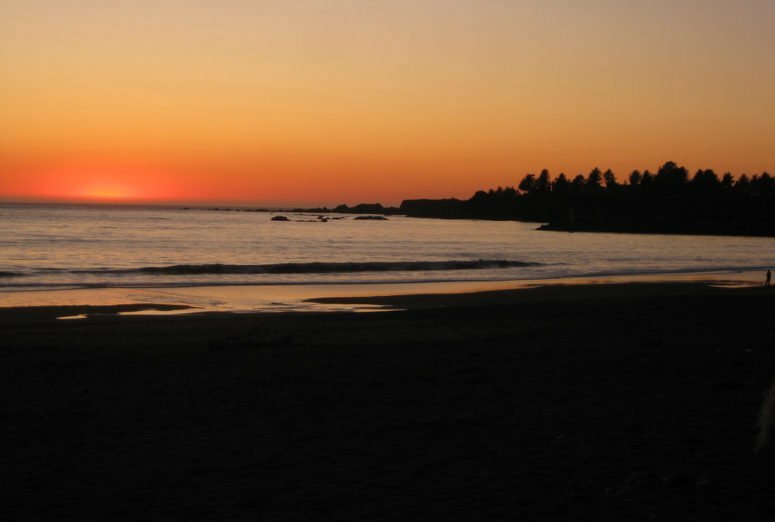 A good place to rest and spend a couple of days in, Gold Beach is a captivating city on the south Oregon coast. If you’re wondering where to stay on the Oregon coast, Gold Beach is a good overnight stop during your west coast road trip, if your trip is spaced out over a few days to a week. I stayed at the Pacific Reef Hotel while I was there, and I have to say, falling asleep to the sound of the ocean never gets old. There is also Arch Rock Brewing Company in town if you’d like to try one of the best lagers in Oregon, if not the USA. Jerry’s Rogue Jets operate out of Gold Beach as well, for a day out on the Rogue River and one of the more unique Oregon coast tours. A jet boat experience is a great way to discover more about the history of this area, and take advantage of the unique wildlife sightings that are in abundance on the Rogue. Said to be a cursed place for the longest time, Port Orford has slowly but surely been making a comeback in recent years. Businesses are finally starting to boom and travelers are now seeing the draw to the place. This stunning segment of the coast includes Battle Rock Park, which has a tragic history. The park is named after a battle in 1851 that the Qua-to-mah Native Americans and Capt. William Tichenor’s men fought. During certain times of the year, this is a convenient spot for whale watching since grey whales like to hang out in the cove area. Appreciate the best part of this coastal area with one of the most popular Oregon coast activities – sea kayaking. South Coast Tours come highly recommended and allows you to tour some of the sea arches and marine life around the cove. Again, if you’re wondering where to stay on an Oregon coast trip, Port Orford is another suggested place to stay on the coast. If you have the money, I could not recommend WildSprings Guest Habitat enough. I stayed there for one night and I seriously never wanted to leave. Lastly, if you have time, a meal at Redfish will give you one of the best dinner ocean views along the coast, and there’s a colorful art gallery next door as well. 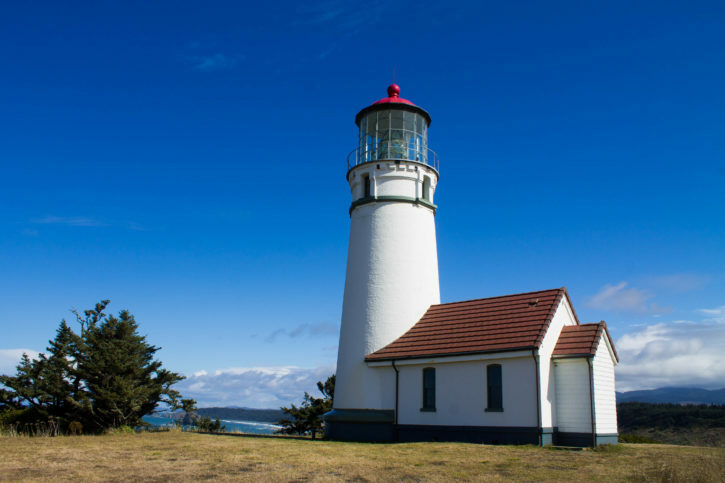 A stretch of the coast that is hardly visited, Cape Blanco is not the easiest to get to. 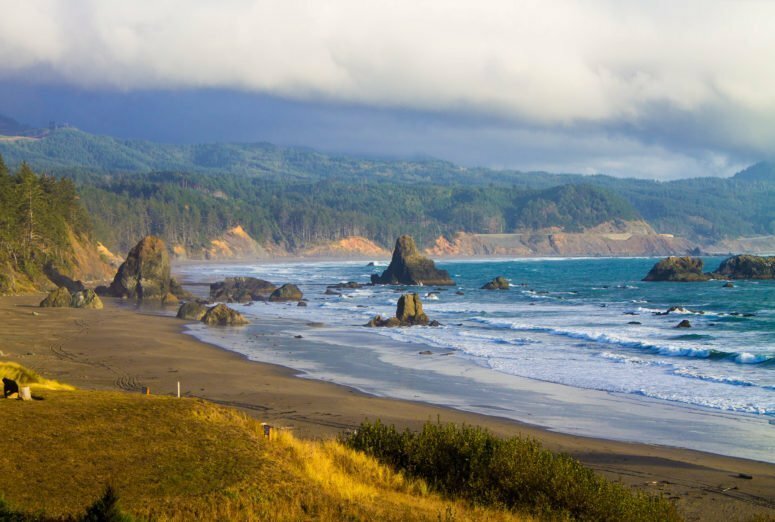 In fact, you will probably have to go quite a bit out of your way, but rest assured that it’s worth the drive, it’s one of the most stunning Oregon coast attractions. You can feel the remoteness of this state park as soon as you step outside your car and the wind hits you in the face. 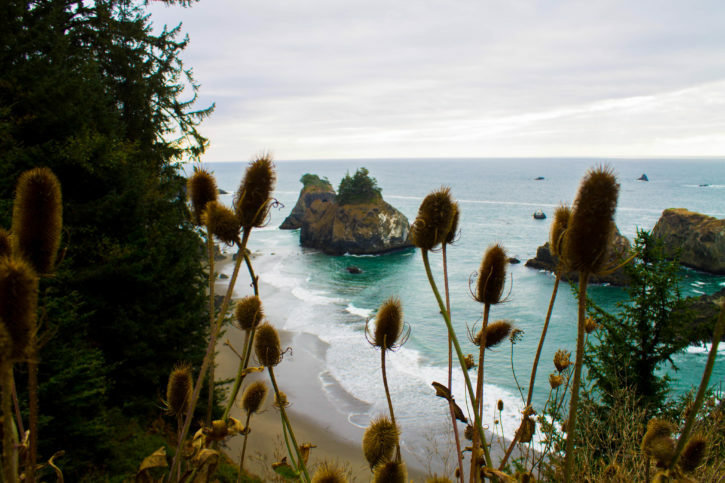 Stops like this are what a coastal Oregon road trip is all about – wild, frenetic energy, that invigorates you, intimidates you, and makes you feel a tad confused. How can there be this much awesome scenery in such a hardened and rugged place? The lighthouse at this park is one of my favorites on the coast. From the outside, Bandon may look like it’s not much different from the many small towns you can find along the Oregon coast. However, Bandon has a personality of its own, an old-timey charm, and a focus on fresh produce and farming. Brandon is known as the cranberry capital of Oregon. If you’re in town during September/October and you’ve never seen a flooded cranberry bog, you’re in for a nice treat. They also host their annual Cranberry Festival the second weekend of September. The homemade fudge and cheese you can find in town are also worth a try! Another spot that’s off the beaten path, Shore Acres State Park is a lovely seaside park that offers great vistas and a five acre garden. If you’re needing a reason to enjoy an Oregon winter getaway, from Thanksgiving to New Year’s Eve, the garden is lit up with a variety of lights and sculptures for the holidays. Shore Acres State Park is located just 13 miles south of Coos Bay, and the drive itself is worth the journey to pass through the beautiful rural parts of Oregon. This is another place to watch migrating whales from the sandstone cliffs during the right time of the year. I visited Florence a few times over the past year and a half since my parents are based only a short distance from Eugene. Florence is about an hour from Eugene, which isn’t too bad for a day trip if you’re going up I-5. Florence is everything you’d want in a small coastal town. 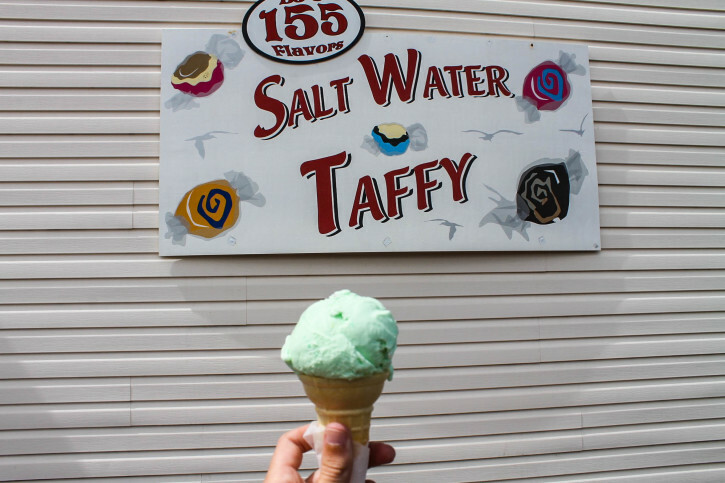 Nice weather year round, kitschy seaside shops, fresh seafood dishes, old fashioned ice cream parlors, and plenty of history. 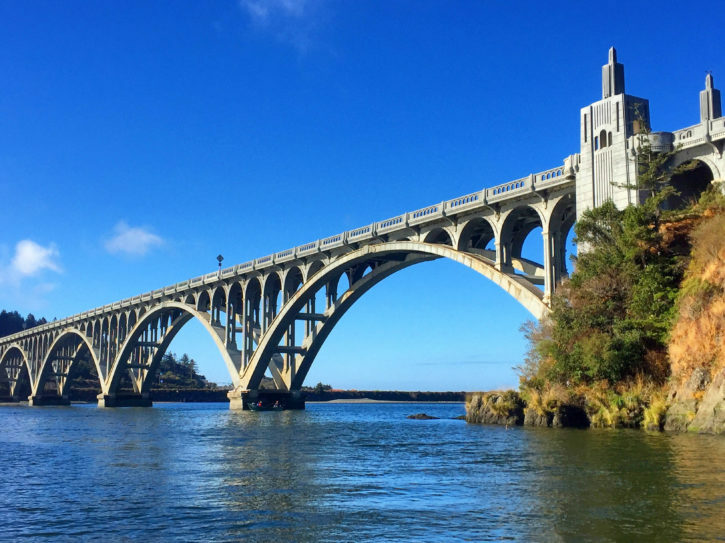 One of my favorite sights in Florence is the art deco Siuslaw River Bridge that was built in 1936. Just a short drive from Florence is the Oregon Dunes National Recreation Area, which is a must-see on any Oregon coast road trip itinerary. And there are the Sea Lion Caves just north of the city as you make your way further up the coast. Make sure to check that the sea lions are actually down in the cave before paying for a ticket because there are no refunds! You may know the scenic Cape Perpetua by its most famous sight – Thor’s Well. Thor’s Well is considered one of the wonders of Oregon. It’s also one of the most popular Oregon coast attractions, and it’s truly a sight to see if you get there at the right time. It’s a natural salt water formation that comes out depending on the height of high tide, the direction and size of the swells, and the wind. Again, you have to time it right, but if you’re able to, it’s a trippy sight to see for yourself. 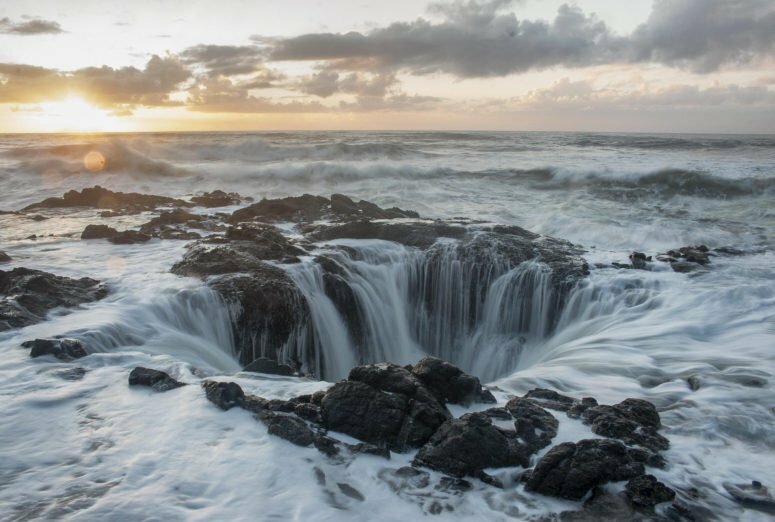 Of course, there’s more than just Thor’s Well to hold your attention at Cape Perpetua. This headland gives you stunning and unobstructed views of the coast. You can see up to 70 feet of coastline and 37 miles out to sea on a clear day at the highest point of Cape Perpetua, about 800 feet above sea level. This is a favorite place to hike along the coast as well. 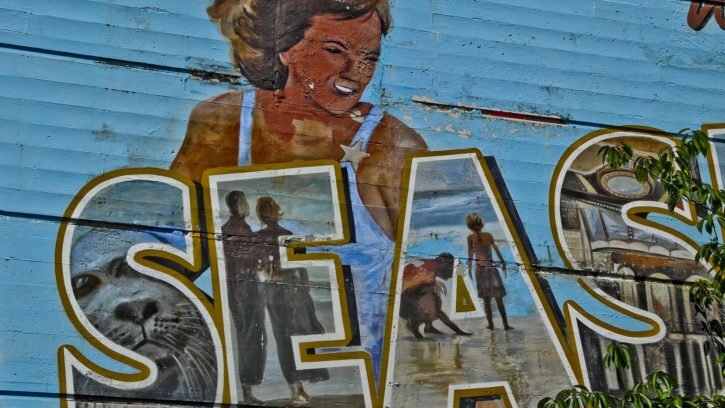 Pacific City is where my favorite brewery in Oregon resides – Pelican Brewing. This brewery alone is worth a stop in Pacific City. It’s right on the beach and there are dunes and a beautiful sunset to watch from the brewery. It would also be an ideal place to watch one of the impressive winter storms that come through this area, and to witness just how beautiful it can be to travel the Oregon coast in the winter. 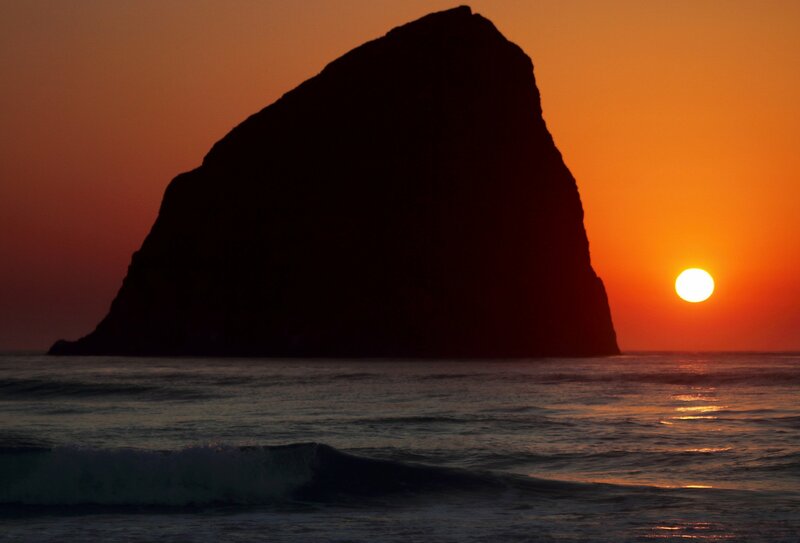 Pacific City is where Cape Kiwanda State Natural Area is located, if you’re looking for more nature time. And if you’re doing a west coast road trip, there should always be more nature time. Any cheese lovers reading this post? Okay, good. 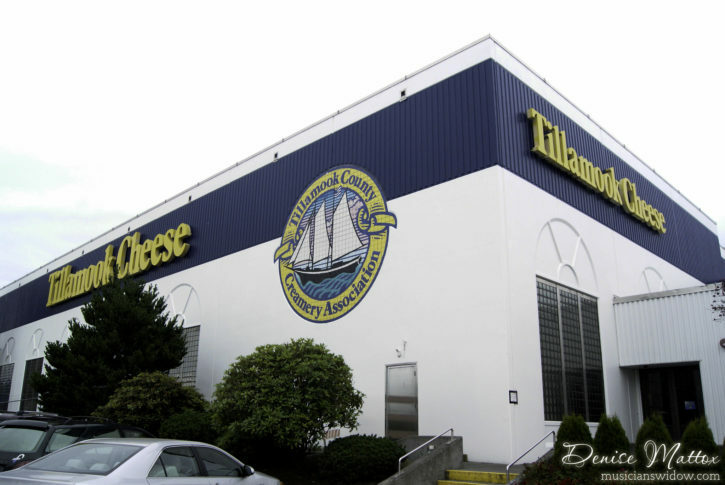 If you love cheese, you have to put Tillamook on your Oregon coast itinerary. Tillamook may ring a bell, especially if you’re from the West Coast, for the famous cheese that comes from here – Tillamook Cheese. I can attest that I grew up with this cheese, and I’ve never found a better every day cheddar cheese than what these guys produce. They have plenty of free samples and delicious ice cream for purchase at their factory too. Other than cheese, the kayaking in Tillamook coastal waters is phenomenal, with more than 800 miles of navigable waters. There are more than a dozen maintained hiking trails in the Tillamook area, if land-based activities are more your thing. I made the short 1.5 hour day trip from Portland to Cannon Beach last year, because I heard that this is where part of The Goonies was filmed. When I arrived, I was not disappointed to recognize the beach and the iconic Haystack Rock that were in The Goonies. 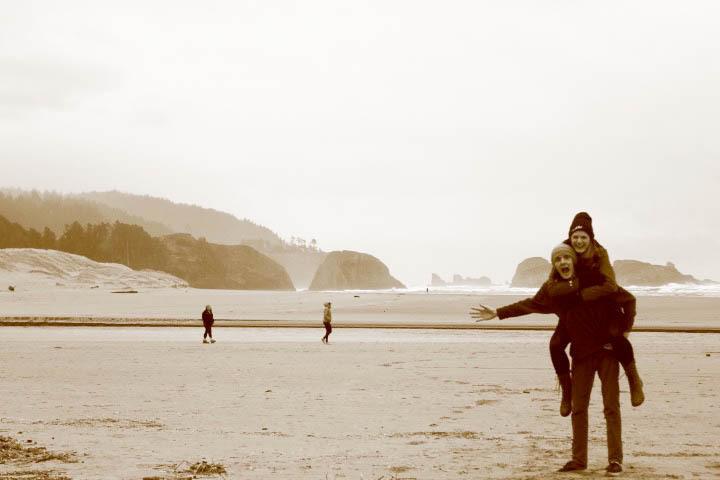 Besides geeking out over a nostalgic childhood movie, Cannon Beach is simply a lovely place to explore. Make sure to stop in for a hike a Ecola State Park, have a picnic on the beach, and try to make their sand castle-building contest in June. This beach can get crowded in the summers due to it being a popular getaway for Portlanders. If you’re wanting a more secluded beach experience, visit this piece of the Oregon coast in the winter or fall for the least amount of people. Just north of Cannon Beach, you’ll come across Seaside – one of the most touristy spots on this list. Even with the crowds, this city is worth at least a quick visit, it must be popular for a reason, after all. They have one of the most impressive 4th of July celebrations in Oregon, with the largest fireworks display on the coast. Seaside is also home to a privately owned aquarium that is one of the oldest aquariums on the whole of the West Coast. And lastly, Astoria is the lovable historical city near the border of Washington State. I remember visiting Astoria as a 17 year old and being enchanted by the 1930s inspired architecture. 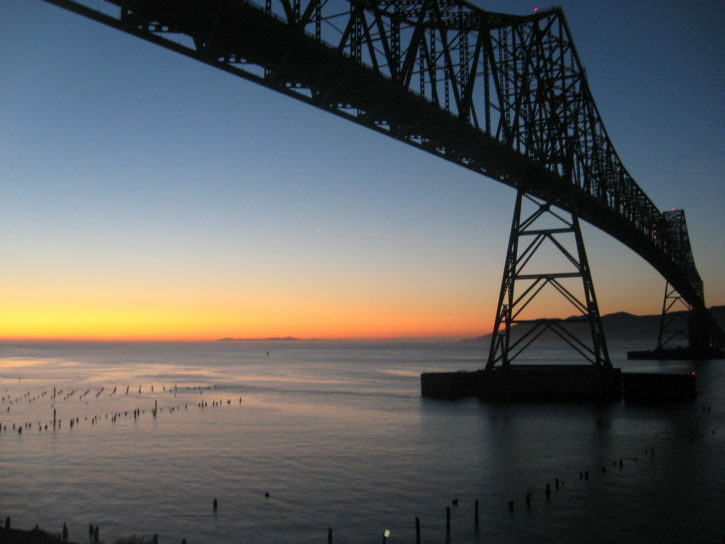 Since Astoria was the first permanent US settlement on the West Coast, it has a lot of intriguing history to discover. Make sure to stop in at a few of the breweries that have opened up in the city, they’re some of the best representations of the Oregon craft beer scene. Cheers yourself for making it all the way up the coast, and seeing some of the most amazing scenery in Oregon along the way. RATHER DO A GUIDED TOUR OF THE COAST? CHECK AVAILABILITY HERE! 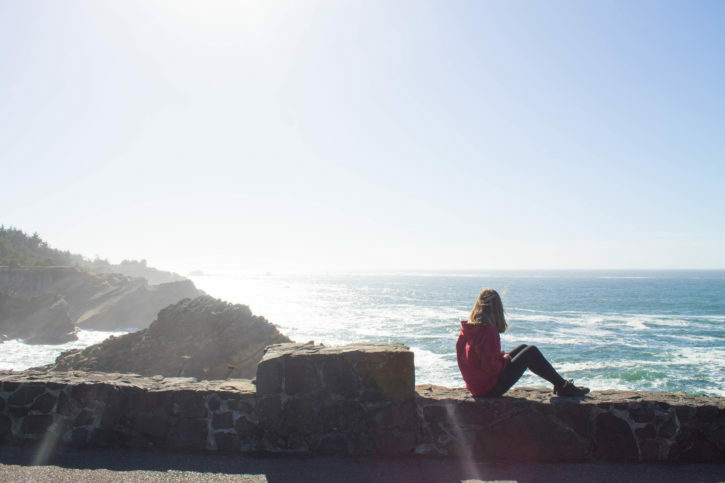 Get your West Coast road trip planner for the Oregon coast below! Have you road tripped up or down the Oregon Coast? What’s your favorite spot to get lost in nature in the US? Book a vacation rental on AirBnB (and get $20 off your first booking). Buy your Oregon travel guide. 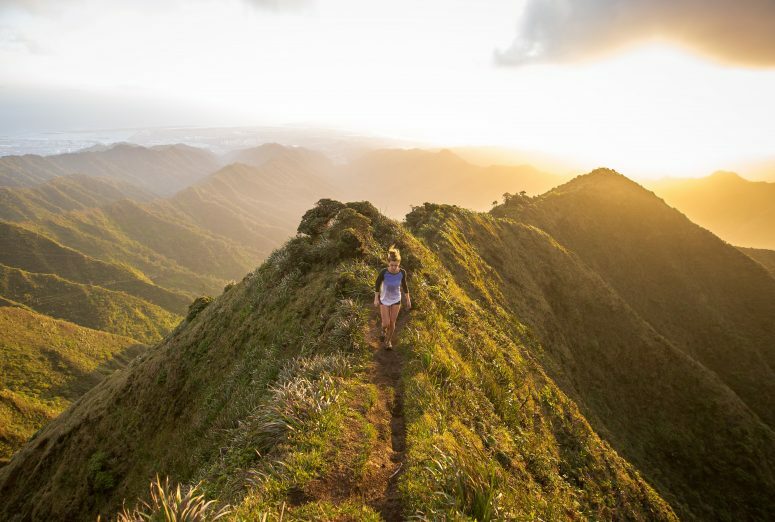 Get your hiking gear ready with this packing list. 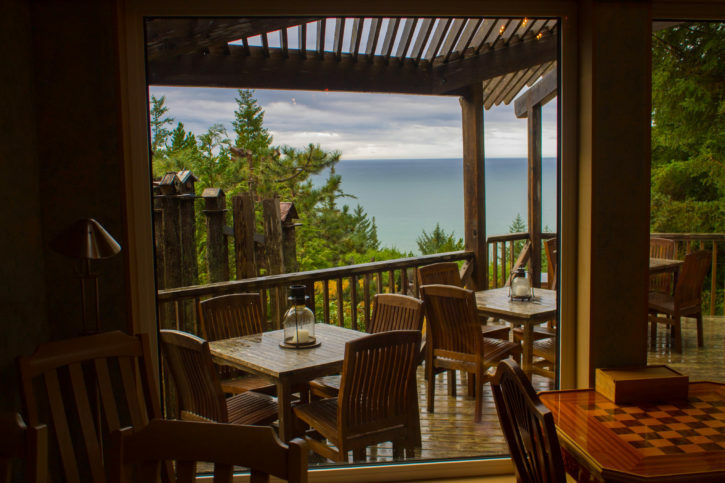 I would love to be sitting on that patio in Port Orford. I haven’t done enough travelling. I’m looking forward to doing more when my daughter is older. We’re from Cape Breton, Nova Scotia, so I feel at home in the woodsy, watery places. Sitting on that patio is the best feeling. I would love to see Nova Scotia at some point soon as well, it looks beautiful where you’re from, Kerry. Wow! Had I not read the title I would have assumed this was a different country. I have visited the Oregon Coast yet but it looks awesome. Will definitely need to plan a trip there. It’s wonderful how diverse this country is – I felt the same when I started road tripping around more areas of the US this past summer, the landscape can change so drastically. Hope you get to visit the Oregon coast soon! 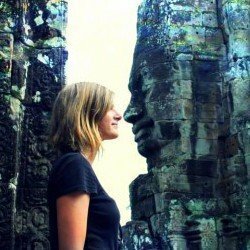 Wow… Beautiful pictures! 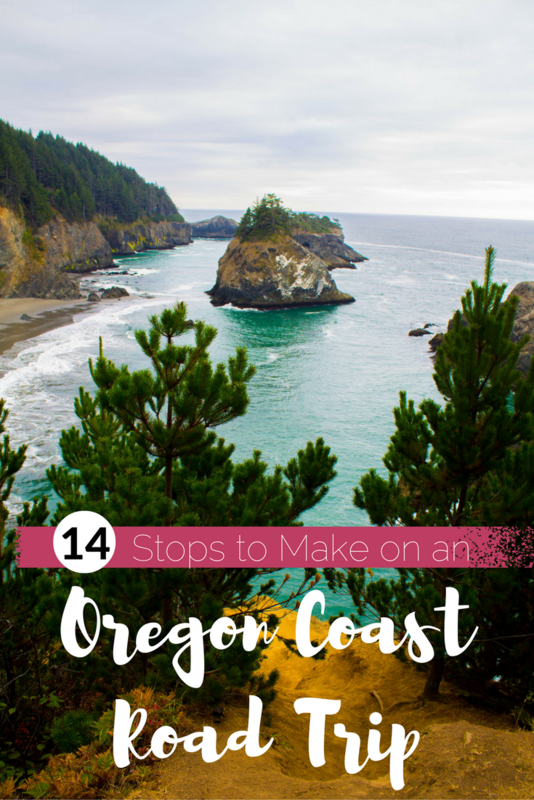 I have been to Tillamook and Cannon Beach, but there’s so much more! You do not disappoint. I’m actually writing this as I settle in for the night in Florence. I drove down from Seattle to the Mt. Shasta, CA area for Thanksgiving, and since I had several more days off, I decided to take the scenic route back to Seattle. I’ve been using your “14 Stops” as a guide, and it’s been working out great so far. I just wanted to say thanks! Stellar post! I’m so happy that you found some use from this post Danny! I love a good Oregon Coast road trip, and I loved writing about some of my favorite spots – enjoy!